This week, 1,662 capital city auctions were held and preliminary results show that 1,365 auctions have been reported so far, with a preliminary clearance rate of 74.6 per cent, rising from a final clearance rate of 74.0 per cent last week across 2,350 auctions. 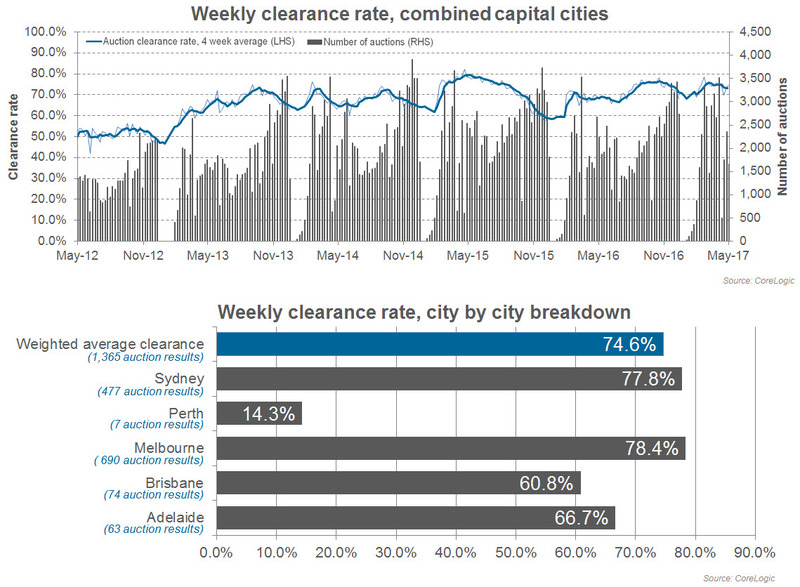 While clearance rates remain above the long term average across the largest capital cities, the rolling four week average reveals a softening trend which can be attributed to Sydney’s final clearance rate drifting lower over the past two months while the trend in Melbourne is holding firmer in the high 70.0 per cent range. Preliminary results show that while Melbourne and Sydney maintain their place as the strongest auction markets, Adelaide and Brisbane have shown a rebound in the downwards clearance rate trend this week. This week’s combined capital city preliminary clearance rate is stronger than one year ago, when 67.7 per cent of capital city properties cleared, however auction volumes are lower than this time last year when 2,230 homes were taken to auction across the combined capitals. Across Melbourne, 782 homes were taken to auction and preliminary results show a clearance rate of 78.4 per cent, up slightly from last week’s final clearance rate of 78.1 per cent across 1,226 auctions. At the same time last year, Melbourne’s clearance rate was 73.2 per cent, with 1,150 auctions held across the city. Looking at Melbourne’s sub-regions, the West region was the busiest for auctions across Melbourne with 130 homes going under the hammer, followed by Melbourne’s Inner region (116) and the North East (101). The North East region was also the best performer in terms of clearance rates, with a 89.4 per cent success rate. Sydney was host to 585 auctions this week, down from 811 last week and 676 at the same time last year. A preliminary clearance rate of 77.8 per cent was recorded this week, representing an increase from last week’s 74.3 per cent and higher than one year ago (71.8 per cent). The performance across Sydney’s individual sub regions was varied over the week. Across Blacktown, where 11 results have been reported so far, the preliminary clearance rate was 36.4 per cent, while across the Central Coast (89.5 per cent) and City and Inner South (88.5 per cent), the success rate of reported auctions was much higher. There were 105 auctions held across Brisbane this week, down from 124 last week, and significantly lower than one year ago (195). Preliminary results for the city show that 60.8 per cent of auctions were successful this week, up from 52.9 per cent last week, while one year ago 41.2 per cent of auctions were sold. Further south, across the Gold Coast, 70 auctions were held over the week and 43 have been reported so far with a 41.9 per cent clearance rate, increasing from 40.9 per cent last week. A total of 95 auctions were held in Adelaide this week, up from 83 last week, and similar to last year (94). Preliminary results for the week show 66.7 per cent sold, up from 63.5 per cent last week. Across Perth, preliminary results show just 14.3 per cent of the 7 reported auctions were successful, while one week ago 34.8 per cent of Perth auctions were successful and one year ago 23.5 per cent were sold. There were 56 auctions held in Canberra this week and the preliminary clearance rate was 65.3 per cent, down from 68.3 per cent last week and higher than one year ago (54.3 per cent). A total of 6 auctions were held in Tasmania this week and so far 3 successful results have been reported.